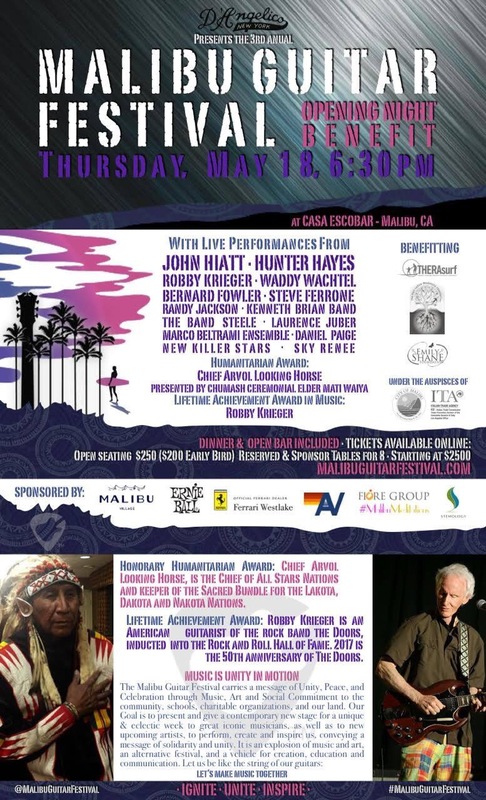 (Malibu, CA) – Southern California’s premiere music festival by the sea, The Malibu Guitar Festival, kicks-off its 3rd Annual event May 18 – May 21, featuring headliner Mick Fleetwood Blues Band; Jamtown featuring Donavon Frankenreiter, G. Love & Cisco Adler; Tommy Emmanuel and Hunter Hayes topping the bill on Main Festival Day — Saturday May 20 — at Malibu Village, presented by D ‘Angelico Guitars. Early Bird tickets are available: https://www.ticketfly.com/org/6059http://www.malibuguitarfestival.com. The brainchild of Malibu resident’s Doug Deluca and John Watkin, both avid music and guitar fans, who utilized their deep passion and connections to bring a grand scale music festival to the shores of Malibu. They reasoned there is no place on the planet with more guitar-lovers, collectors, and aficionados per square mile than Malibu, noting how the guitar unites us all. From surf junkies with battered acoustics on the beach, to billionaire aficionados with priceless collections, the thriving beach community and the classic musical instrument seem to go hand-in-hand. Deluca and Watkin saw an opportunity to bring the community together with a high level music festival, featuring globally renowned, award-winning legendary musicians, while supporting local musicians and giving back to charity. 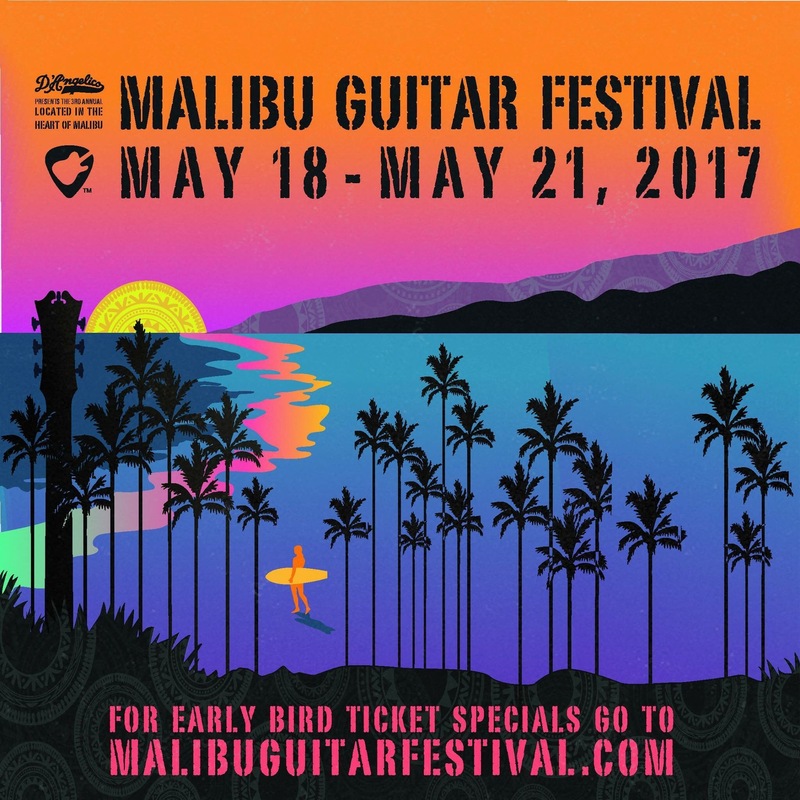 The Malibu Guitar Festival brings pro-players, amateur strummers, rock legends and guitar makers together for three days of unforgettable live performances. D’Angelico Guitars recently received “Best in Show” for companies to watch at the 2016 NAMM Show, due in part to the New York made Master Builder Series. Over the course of more than 80 years, D’Angelico has moved from a tiny shop in Little Italy to a sprawling showroom in midtown Manhattan, but their promise remains the same: to produce exceptional guitars that uphold the legacy of founder John D’Angelico. With guitars in the hands of hugely influential artists and available at dealers worldwide, D ’Angelico guitars are back for good. The D ‘Angelico lines, featuring both reissues and new semi-hollow designs of all sizes, are defined by their remarkable quality and tone. Bob Weir, Susan Tedeschi, Brad Whitford and an army of additional musician/endorsers speaks volumes for the quality of the instruments. At D ‘Angelico, they maintain their legend by guaranteeing the utmost quality made with the utmost passion. Will this be live on the internet.